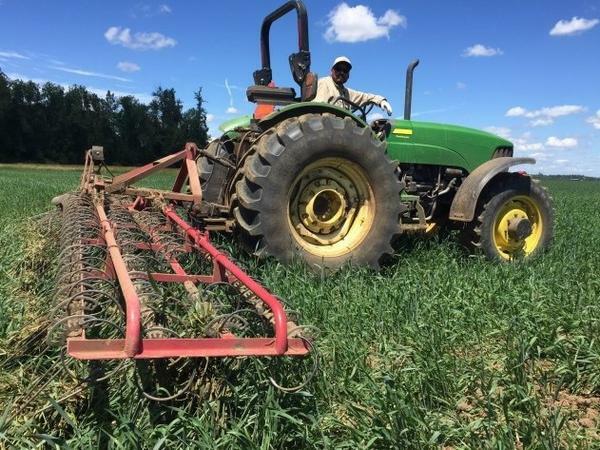 A farm worker runs a tine weeder on Jason Hunton's organic wheat crop. It's like a giant comb, scraping up weeds and bits of wheat along with it. This spring was strange in Oregon's Lane County. "It rained every day. I'm exaggerating, but only by two days," says farmer Jason Hunton. When Mother Nature rears her ugly head, Hunton watches his fields. He farms both organic and conventional land in Junction City, Ore.
"We're struggling. We've got a couple of [organic] fields that have some real thistle problems. I want to get some tarps and solarize it — cover it up and see if we can get that to cook itself in some of the thicker areas," Hunton says. Several fields down the road, a tine weeder runs through one of Hunton's organic wheat crops. It's like a giant comb, scraping up weeds and bits of wheat along with it. This is the third time this year that Hunton has tine-weeded this field. It's an all-day job. In his conventional wheat fields, he can spray once and be done with it. "We use a lot of steel and diesel to control weeds," Hunton says. "It's not easy being a farmer, but it's easier being a conventional farmer." Hunton's got few options in his toolbox. He can use diesel and steel, walk away from a field or spray it with herbicides, which will wipe out the weeds fastest. But then he's got to wait up to three years to re-certify that field as organic. For Azure Standard, based in Oregon's Sherman County, spraying is out of the question. The company wholeheartedly believes in organic food. David Stelzer, Azure Standard's CEO, says an organic food option is a matter of life and death for people with certain diseases and sensitivities. The farm's weeds — and how to better manage them — attracted a global spotlight on the rural county this spring. Azure Standard's neighbors complain that noxious weeds are encroaching on their property. Bryan Cranston grows seed wheat across the road from Azure Standard. He says an errant noxious weed could cost him five years of higher profits on that field. "These are bad weeds. They just take over," Cranston says. The weeds include rush skeleton, Canada thistle, bindweed, white top and diffuse knapweed. Starting in 2006, the county sent Azure Standard weed violation notices. This year, the weed district stood its ground: The farm must manage the spread of noxious weeds. Stelzer says he doesn't want weeds, either — but he doesn't see it as a major issue like the county does. "I want to be able to knock them out, but I'd like to do it the right way. The last thing I want is to kill them with a deadly toxic chemical," Stelzer says. County officials sent a letter demanding the company take care of the weeds — authority typically used as a last resort. That's when the company posted two videos to Facebook. The videos spread across the Internet like, well, weeds. The county received more than 59,000 emailed comments — some from as far away as New Zealand. Before, the most comments they'd received on a single measure was something closer to five. After a sometimes-contentious public meeting last month, the county and the company agreed to come up with an organic plan to better manage the weeds. It's going to take a lot of work. There's no silver bullet for organic farms. "You have to be more persistent than the weeds, and we know they are really persistent," says Ian Burke, a professor of weed science at Washington State University. "It's all about having the people to be out there and be actively managing." Without herbicides, it's hard to spend the money and commit the time to managing a lot of acres by hand. Two of the biggest problem weeds, he says, are Canada thistle and field bindweed. That comes from personal experience and farmer surveys. "They'll root to dozens of feet deep. I've got a picture of Canada thistle rooting through asphalt," Burke says. "It's very difficult to make any headway once you get a ... Canada thistle infestation. It's a long, hard slog to get back to something like an acceptable population." And weed scientists don't even really know what an "acceptable population" looks like, he adds. Legally, noxious weeds have to be managed properly. No one in Oregon can quite remember a situation like what happened at Azure Standard. Officials say they're happy with the final weed control plan, which allows Azure Standard to "use whatever methods they see fit to achieve control on all properties managed by them in Sherman County." The plan also allows weed district officials to monitor the company's fields for noxious weed seeds that could be blown by the wind onto neighboring farms. Azure Standard will work to reduce its noxious weed populations each year. Weed experts say it will take years. Azure Standard did not respond to requests for comment about the final plan. Oregon Tilth, an organic certification company, conducted a national survey of farmers that found weed management is the main challenge to overcome while transitioning to organic fields. "One thing about organic management systems: the longer you stay at it, the more you learn and the better you get," says Chris Schreiner, executive director of Oregon Tilth. That's been Hunton's strategy. He transitioned six acres to organic in 2009. Now he has roughly 300 acres of organic crops. He says there's instant gratification in a job well done. And even though he feels for Azure Standard's thistle issues — his own problem field is "blowing up" with thistles — Hunton says it's about respecting neighbors. "I don't want my problem to be his," Hunton says. And maybe one day weed management will be easier. Burke says the future may be in tech. "I have high hopes for robotics," Burke says. In fact, the inventor of the Roomba (the robot that vacuums your floors) has already built the Tetrill, a weed-cutting bot aimed at organic home gardeners. Right now, it's scheduled for release in spring 2018. "People are thinking about weeds and weed management in ways that are pretty innovative and unique, based on technology we've never had available to us before," Burke says. This story comes to us from Northwest Public Radio and EarthFix, an environmental journalism collaboration led by Oregon Public Broadcasting in partnership with six other public media stations in Oregon, Washington and Idaho. Copyright 2018 Northwest Public Broadcasting. To see more, visit Northwest Public Broadcasting.